The Chen-style Taiji Double Broadsword has 35 forms and is one of the Chen-style Taiji Double Weapon routines. The arrangement of the routine is rational and tightly interlinked, with clear-cut and practical movements. 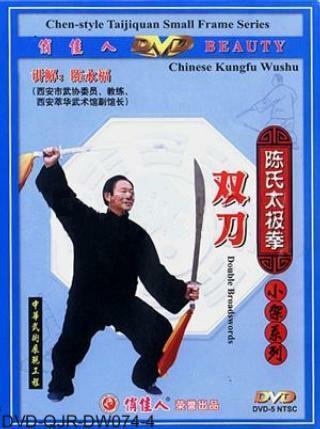 By integrating the broadsword techniques of cutting, hacking, arcing, parrying, thrusting, crossing, crosscutting, pressing, pushing, slicing, sweeping, supporting and figure-8 form with Chen-style Taiji Quan's open and spreading bodyworks, agile and stable footworks, the double broadsword are played with full embodying of Chen-style Taiji Quan's features of hardness and softness in harmony, fastness and slowness in intervals, relaxing, activeness, flipping and shaking in force application. Practicing the routine of double broadsword must have the broadswords in line with your footwork, as the saying goes that "playing single broadsword well depends on hand; while playing double broadsword well depends on footwork" to emphasize the importance of your footwork in double broadsword. For good footwork, Taiji Quan is the basic. Only when you have grasped the sturdy basic skills of Taiji Quan, you can then reflect the style and characteristics of broadsword like playing the broadsword as flowing water with flying footwork, twining and wrapping head, fast and forcefully, boundless vigor, hardness and softness in harmony.